Earn $22.90 in VIP credit (2290 points)What's This? Featuring their cutting-edge JOF (Just Off Front) geometry and pressure mapped construction, the Fifty-Five Saddle from Cobb Cycling is comfortable and versatile – built to enhance the performance of triathletes, time-trialists, and even roadies. 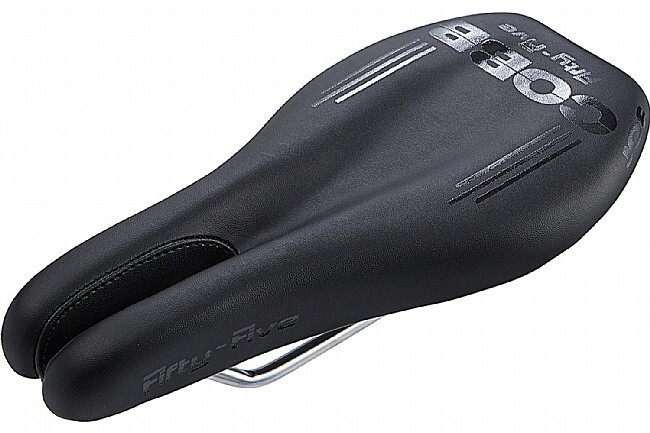 The JOF geometry of this saddle has a short front, longer rear and slender sides. The short nose allows riders to hang off the front for an optimal aerobar position. The long rear enables riders to assume a comfortable neutral position when needed for breaks or pursuits. The slender sides of the saddle reduce thigh friction and prevent hamstring interference. The Fifty-Five was designed for tri and road bikes so roadies can take advantage of its superior construction too. Thanks to its waterproof stitching, this saddle stands up against rain and years of use. Conveniently, the Fifty-Five is compatible with Cobb Cycling’s rear hydration mount so the rider can utilize a range of hydration options.